Firmware Update for MI0283QT-Adapter v2. It is also possible to use an Arduino Uno for the firmware update. 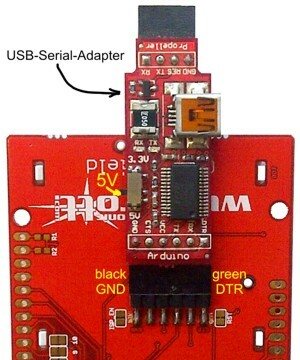 In this case remove the AVR microcontroller from the socket on the Arduino and connect the board as follows. 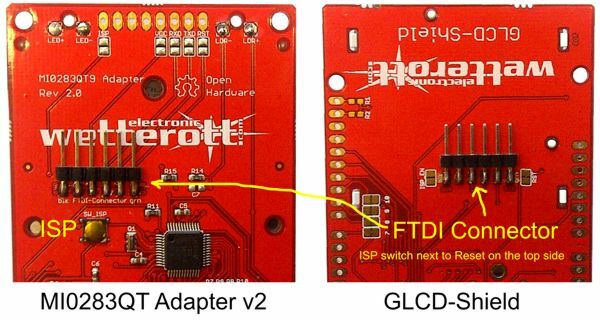 The firmware can be updated via the FTDI connector using LPCSP (alternative download). Connect a 5V USB-Serial-Converter with FTDI pinout to the 6-Pin FTDI connector on the PCB bottom side (blk=GND, grn=DTR). Release the ISP switch after the programming (entering ISP mode) has started. Wait till the programming has finished. The firmware can be updated via the FTDI connector using Flash Magic. Hold down the ISP switch (next to the ARM controller on the MI0283QT Adapter and next to the reset switch on the GLCD-Shield) and press the Start button.